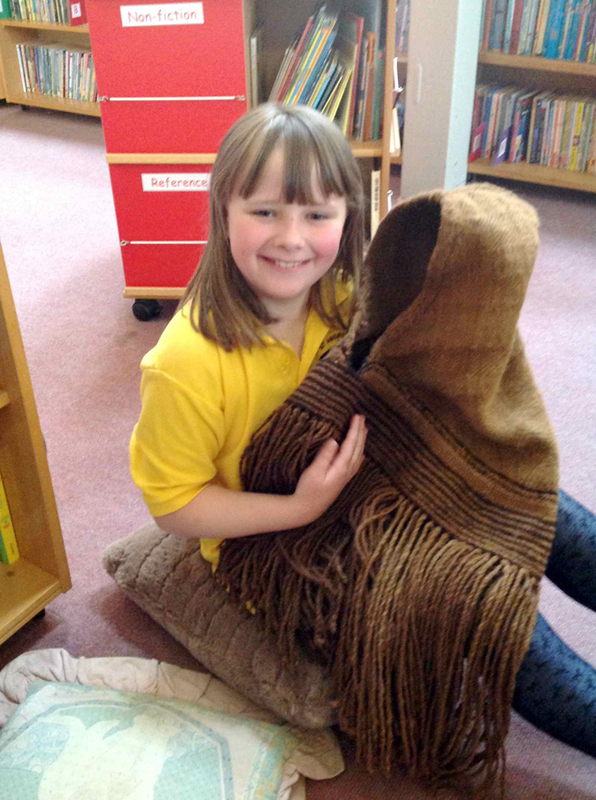 Known as the ‘Orkney Hood’, a unique woollen garment made for a child over 1500 years ago, was recently the focus of an activity day in an Orkney School. Pupils from P3 and P4 classes at St Andrews School in East Mainland, close by the site where the woven hood was found in a bog over 150 years ago, had an opportunity to examine and study an expertly-made replica of the hood at close range. The activity day, organised by Lynda Aiano and staff of St Andrews School, was devised as part of the ‘Touching the Past’ Research project run by the University of Exeter in partnership with National Museums Scotland, led by Dr Linda Hurcombe at Exeter and Dr Alison Sheridan at NMS Edinburgh. The ‘Touching the Past’ project aims to show how touch experiences can be provided for even the most challenging ancient artefacts. Most museums’ presentations of archaeological artefacts are dominated by displays behind glass; vision dominates the sensory experience. The emotional connections built by more multisensory engagement with artefacts offers a better appreciation of the ancient objects and an enhanced museum visit. The projectʼs focus is on icons of identity which are too precious to allow handling and items which are too fragile to touch, such as ancient clothing. The project is developing a range of installations to deliver touch experiences within a museum setting and the activity described here forms part of the exploration of ways in which this can be achieved. The original hood is a very rare survival of an intact child’s garment from the Iron Age and it is on permanent display in the National Museum in Edinburgh under strict environmental conditions. The painstakingly produced replica was made around 10 years ago by Jacqui Wood and is usually on display at Orkney Museum. 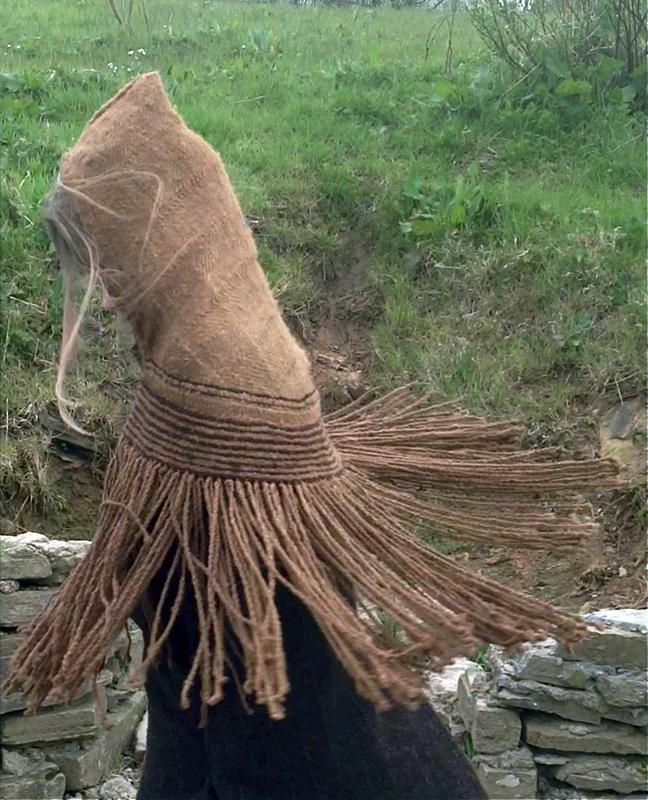 The dimensions of the long-fringed hood indicated that it had been made for a child aged around eight years old, and the existence of the replica meant that the hood could be both enjoyed and closely studied by children of the same age as the original Iron Age child who owned and wore it. While the real hood is only available for looking at in a glass case, the children were able to hold it, feel its texture, examine it inside and out, try it on and smell it. They were particularly intrigued by the long fringed edging. The children engaged fully with the activity which aimed to bring them closer to a child of around their age living in their locality 60 generations before. Their observations were thoughtful and enlightening, and what follows is a sample of the quality of their responses: they noticed that when it fitted one of them across the shoulders, the fringe would reach just to the wrists and the head section would be just the right length too. Whilst it was warm on the head, the fringe cape part was cooler, although you could get your hands out easily to do things. The fringe was likened to a ‘spaghetti beard’ and the way it moved compared to the way a kilt swings. Wearing it was like having extra hair, someone observed, while someone else suggested that ‘it would be very annoying if you were eating and the fringe got in the way’. Although the children were not impressed by the design of the hood in current fashion terms, there was much appreciation of how warm and comfortable it was to wear, along with surprise that it wasn’t as itchy as it looked. The smell was likened to that of an ‘old cupboard’ and ‘my teddy’. Trying on the hood raised many great questions among the children; was the hood worn by a girl or boy? Was the brown colour a dye or a result of having lain in a bog for hundreds of years? How did it end up in the bog? Was it made for a special child? For one child wearing the hood ‘did sort of remind me of the person who wore it’. The opportunity for the children to handle and try on the replica hood enabled them to engage with it in ways beyond just looking. The closer access drew great discussion and insights from them as for a while they got closer to that local child who wore the hood at least 1500 years before. The ‘Touching the Past’ research team is collaborating with Orkney Museum and the Orkney International Science Festival to present a short exhibition which explores the ways in which museum artefacts can be made more accessible. This will include a number of approaches to giving more ‘hands-on’ opportunities, ranging from the use of craft-produced replica items such as the hood, to the latest developments in hapticdevices and replication achieved by 3D laser scanning and 3D printing. The exhibition will run alongside the Science Festival from 5-11 September, and will be in the Archaeology Galleries of the Orkney Museum on September 5 and 6, and 9-11 inclusive, moving to the Family Day of the Science Festival at the King St Halls on September 7. We would like to thank staff and pupils of St Andrews School for taking part in the project, and Orkney Museum for the loan of the replica Orkney Hood which is on display at the Museum in the Iron Age gallery. Lynda Aiano works in archaeology, education and collections management. Within archaeology she is particularly interested in experimental approaches, palaeobotany and ethnoarchaeology. In 2012 she created a website; www.howe.scapaflow.co which examined the uses of over 70 plant species identified from the excavation at Howe, Stromness, a large site which was occupied over four millennia. Currently based in Orkney, she is a researcher for Exeter University, working on ‘Touching the Past’, a project which seeks to explore ways in which rare and delicate museum artefacts can be made more accessible to those who are interested in them.